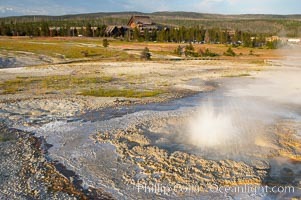 Anemone Geyser erupts, Old Faithful Inn visible in the distance. Anemone Geyser cycles about every 7 minutes. First the pools fills, then overflows, then bubbles and splashes before erupting. The eruption empties the pools and the cycle begins anew. Upper Geyser Basin. Anemone Geyser Photo. 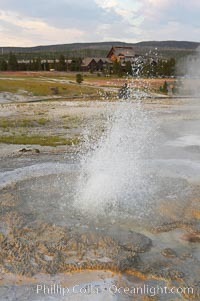 Anemone Geyser erupts, Old Faithful Inn visible in the distance. Anemone Geyser cycles about every 7 minutes. First the pools fills, then overflows, then bubbles and splashes before erupting. The eruption empties the pools and the cycle begins anew. Upper Geyser Basin. Anemone Geyser Picture. Anemone Geyser erupts. Anemone Geyser cycles about every 7 minutes. First the pools fills, then overflows, then bubbles and splashes before erupting. The eruption empties the pools and the cycle begins anew. Upper Geyser Basin. Stock Photography of Anemone Geyser. Anemone Geyser. 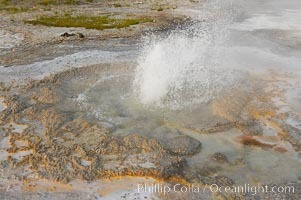 Between eruptions, Anemone Geysers vent pool empties completely. Upper Geyser Basin. 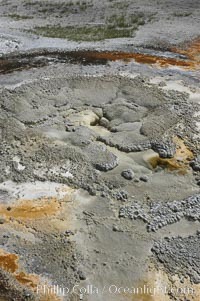 Photograph of Anemone Geyser.